Searching for Blue Spruce Christmas trees? The blue spruce (picea pungens) is an evergreen conifer that is well-liked for it’s unique blueish colored needles and pleasing natural scent that is common in most spruces. Chosen as the official state tree of Colorado, it is also a popular choice for a Christmas tree and a beautiful year-round addition to any landscape. These excellent specimens as well as a wide variety of other wonderful landscaping trees are for sale through G&S Trees. Click to search for a Blue Spruce tree for sale. We carry several sizes. Although this species is native to the Rocky Mountain range, it’s popularity has spread to all corners of the US; and Appalachia is no exception! Appalachian Farms offers a large selection of these magnificent conifers. The tree goes by many names such as the Colorado spruce, white spruce, water, spruce, silver spruce and parry spruce; however, due to its unique color, most people just refer to it as the blue spruce. In the wild, this species can grow to a whopping 75 feet. But planted in backyards, gardens and parks, they typically only reach upwards of 50 feet tall. It typically grows best close to water sources like streams and sometimes moist canyon bottoms, which is where it gets one of its many monikers: the water spruce. Another of its names, Colorado spruce, is due to its indigenous distribution throughout the Rockies. It was also designated the state tree of Colorado in 1939. 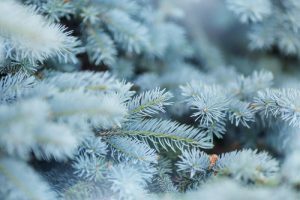 Luckily for customers of G&S Trees, you don’t have to be a Coloradoan to have one of these blue beauties in your yard or in your home during the holidays. Appalachian Farms has blue spruces and a variety of other landscaping and Christmas trees for sale year-round. The wide selection isn’t just available to residents in surrounding Appalachia, G&S Trees ships their stock of landscaping trees and shrubs nation-wide.